The LA Hotel & Resort is situated in historic village Lapta, a beautiful and pleasant holiday spot where everyone likes to spend most of the days. 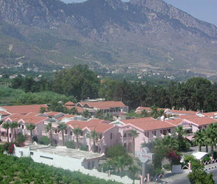 This hotel is located at a distance of just 14 kms from the Kyrenia port in Girne. This hotel owns a private beach especially to their guests to provide them privacy and security during the holidays. This beach also contains seafront bar, restaurants, and recreation facilities which makes the guests to have a great fun around this place. Besides all other things, the hotel is surrounded by full of flowers and gardens which makes the atmosphere pleasant. Rooms are designed with great care and with stylish look so that the look itself shows the grandeur nature. All rooms have facilities like bathrooms with shower, TV sets, hair dryer, and also gives a tremendous view of sea and mountains as it is situated in the lands between that. The hotel incorporates three pools such as indoor swimming pool, courtyard swimming pool surrounded by sun decks and finally beach front swimming pool this is situate next to the private sandy beach of LA Hotel & Resort. This hotel also has 5 bars with all time music and entertainment and for dining it has 4 different kinds of restaurants.